The difference between our Mac and Magic range of DC-DC converters is the galvanic isolation. This is indicated by the addition of 'gi' in the name Magic compared to Mac. The converter uses switch-mode technology, which results in a lightweight, safe, reliable and efficient unit. 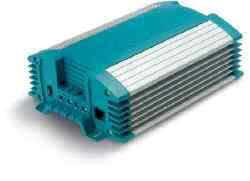 Built in a rugged aluminium extrusion body, the converter is completely shock proof. The unit generates little heat, which makes it easy to find a convenient location for installation. The corrosion-proof casing takes care of cooling together with a temperature-controlled fan. The inlets and outlets feature complete galvanic isolation which makes them completely interference-proof. If you have many power-consuming devices onboard, the parallel use of several units can allow capacities of 40, 60 or more Amps.